The heritance from the eastern cultures is very ancient, powerful and rich. When it’s about music and sounds, we may find hundreds of chanting techniques, Mantras and the wisdom of Naad Yoga, and also instruments. Besides what western people usually think if they are asked about what a musical instrument is, in eastern music we can find some which work really different, not only because of how they’re playing but also because of its purpose. Learning about Gongs and Tibetan Bowls; let us explore a different optic about sounds and about ourselves because as resonant beings we just need harmonic sounds close to nature to stay happy. Tibetan Bowls, as well as Gongs, are very special instruments as they’re meant to reproduce the original sounds of the Universe and in a certain way of speaking, with them, you can play ‘the sound of silence’ and promote that quietness in listeners’ minds. Their circular shape promotes better acoustics and its sound represents the perfection of the creation. Another special aspect to know about them is that, in contrast with the most of the instruments, you can play them without any previous knowledge and do something maybe simple, but beautiful. Your spontaneous way to use it also has a lot of messages that a therapist or experienced player can use to ‘read’ how you really are and how you feel. Thus, meditating along with Tibetan Bowls isn’t just about absorbing the effect of their sounds and getting involved by peace. In case you can play one of them, you must take the chance to listen to them carefully, as a way to connect to Here and Now and to know yourself deeper. Next we explain how to meditate along with Tibetan bowls and also share with you details you can focus on to ease this wonderful introspection with you as the player or being played by a therapist or stereo. As any meditative method, it works better if it’s done after a yoga class or relaxation process to ease focus. Looking for a nice place is also important: neutral or comfortable smell, dim or natural light, quiet and with good vibes. This instrument is quiet simple to play, but there are many variations we can do to produce specific effects with it. Hold it on the palm of your hand or on the tip of the fingers if it’s too small. It’s also common to put it –especially if it’s a big one (like quartz bowls) – on a cushion customized for them. There are 2 main ways to play them: by tapping it or rubbing the border, drawing continuous circles. For both techniques a specific mallet is needed. This mallet must be adapted to the size and material of the Bowl, but it usually comes included with the instrument as well as with the cushion. It’s the simplest way to use a Tibetan Bowl. Just knock the border softly. Then, just let the sound invade your mind and the surroundings and you’ll start to dive into a meditative mind state. Start rubbing the border with the mallet, slowly and clockwise. You must apply a gentle pressure to evade the mallet to bounce out. If the Bowl isn’t too big, the right thing to do is keeping your hand over the center of the bowl while making the circular movement from there. This way you’ll stimulate a deeper peace, as your mind –represented by your hand- will stay centered. By moving the wrist constantly, you’re also improving your communication with your Soul. Some Bowls or mallets won’t allow producing any sound by rubbing, so don’t force it. The practice on keeping the bowl sounding with moderate intensity is a great way to meditate about our mental stress and tensions and how to keep a balanced energy and reduce stress. When rubbing a bowl, we also have the chance to connect not just our mind but also our physical body to that sound to get a deeper meditative state. Once you domain the rubbing technique, focus on inhaling during the half of the circle and exhaling during the other half. This way, the movement of your hand will flow easier, as it becomes into a consequence of your state of consciousness and not backward. You can also vocalize trying to produce the same note of the bowl, or improvise a sweet chant while you hear its sound to experience a deeper feeling on how it ‘travels’ as you become one with it. 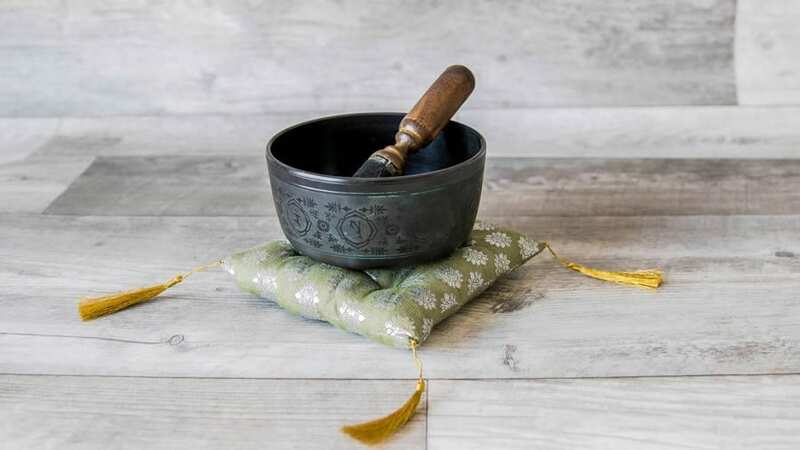 Tibetan Bowls, as well as modern quartz bowls, are designed to produce one specific note only, which through will connect and stimulate specific Chakras or organs of the body. If you have several bowls, you can use them to meditate on specific aspects about yourself or use it to calm or heal others, taking in count also the material from which the instrument is made. In case you’re a professional who wants to use them in clinical application, you can even set bowls on specific parts of the body of the patient next to it, but this practice may have a real direct impact on health due to this closeness to the organism. Therefore, this kind of sonic therapy must be done by people especially instructed on this technique.